We have yet to meet anyone who has sat on a mountain bike saddle in this country, who does not have a passion for mountain biking in Nepal. 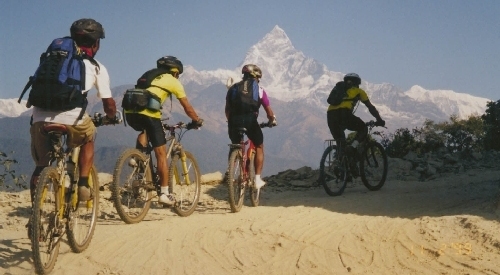 Biking the trails in Nepal provides cycling in its entire element; a socially, environmentally and economically viable form of transport which involves fun, recreation, adventure, travel and a whole wealth of culture. Biking,there is no better way to get around the Kathmandu Valley or to routes further afield and yet feel part of the nature. Biking here in the land of the gods, takes you through breathtaking scenery and straight into some of the most vibrant and exoctic culture you are ever likely to have come accross.The outcome of a day in the saddle is often a true sense of togetherness at the end it..
Biking trails, like trekking trails, range from easy to extreme, Boundless Himalayas Trekking & Expedition organises tours within the Kahtmandu Valley and selected trails further afield. All Mountain bike tours are led by a qualified mountain bike guide and come with three meals a day.